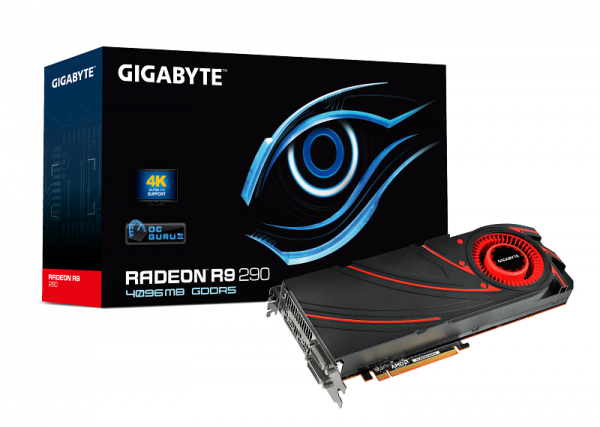 Taipei, Taiwan, 6th Nov 2013 – GIGABYTE, a leading manufacturer of motherboards and graphics cards, is pleased to introduce the latest Radeon R9 290 graphics card (GV-R929D5-4GD-B). Engineered to be among the world’s most advanced graphics cards, Radeon™ R9 290 GPUs feature award-winning GCN Architecture for unrivalled performance and efficiency. Packed with groundbreaking features like AMD PowerTune technology and AMD CrossFire™ technology, gamers should never settle for anything less. GV-R929D5-4GD-B is equipped with 28nm GCN architecture graphics processor, 4GB GDDR5 memory and 512-bit memory interface, and also exclusively supports GIGABYTE OC GURU II software. GV-R929D5-4GD-B is primed to enable astonishing performance and breathtaking image quality, making it a top choice for gamers who expect the best. GV-R929D5-4GD-B provides gamers an unlimited experience by using GIGABYTE OC GURU II to adjust maximum core voltage and synchronize the GPU temperature and power consumption. These main features deliver an extremely performance to make gamers enjoy the amazing gaming experience. For more details about GIGABYTE GV-R929D5-4GD-B, please visit the official website.